Adopted from ICMJE Recommendations for the Conduct, Reporting, Editing, and Publication of Scholarly work in Medical Journals (http://www.icmje.org/recommendations/browse/roles-and-responsibilities/protection-of-research-participants.html). When reporting experiments on people, authors should indicate whether the procedures followed were in accordance with the ethical standards of the responsible committee on human experimentation (institutional and national), or if no formal ethics committee is available, with the Helsinki Declaration as revised in 2008. If doubt exists whether the research was conducted in accordance with the Helsinki Declaration, the authors must explain the rationale for their approach and demonstrate that the institutional review body explicitly approved the doubtful aspects of the study. Patients have a right to privacy that should not be violated without informed consent. Identifying information, including names, initials, or hospital numbers, should not be published in written descriptions, photographs, or pedigrees unless the information is essential for scientific purposes and the patient (or parent or guardian) gives written informed consent for publication. Informed consent for this purpose requires that an identifiable patient be shown the manuscript to be published. Authors should disclose to these patients whether any potential identifiable material might be available via the Internet as well as in print after publication. Patient consent should be written and archived with the journal, the authors, or both, as dictated by local regulations or laws. Applicable laws vary from locale to locale, and journals should establish their own policies with legal guidance. Since a journal that archives the consent will be aware of patient identity, some journals may decide that patient confidentiality is better guarded by having the author archive the consent and instead providing the journal with a written statement that attests that they have received and archived written patient consent. Nonessential identifying details should be omitted. Informed consent should be obtained if there is any doubt that anonymity can be maintained. For example, masking the eye region in photographs of patients is inadequate protection of anonymity. If identifying characteristics are de-identified, authors should provide assurance, and editors should so note, that such changes do not distort scientific meaning. The requirement for informed consent should be included in the journal’s instructions for authors. When informed consent has been obtained, it should be indicated in the published article. When reporting experiments on animals, authors should indicate whether institutional and national standards for the care and use of laboratory animals were followed. Further guidance on animal research ethics is available from the International Association of Veterinary Editors’ Consensus Author Guidelines on Animal Ethics and Welfare. Juvenile rectal polyp with osseous metaplasia- A rare case report. Study of Keratinocyte Proliferation, Apoptosis and Dermal Inflammation in Psoriatic Skin Lesions Before and After Methotrexate Therapy: Which Change Is Contributing More to Clinical Severity of the Disease? ROLE OF MELATONIN IN AMELIORATING CYTOTOXIC EFFECT OF GOLD NANOPARTICLES ON THE PULMONARY ALVEOLI OF ADULT ALBINO RATS. Acute and sub-chronic oral toxicity studies on the methanol leaf extract of Gnetum africanum Welw in wistar rats. Evaluation of hepatoprotective activity of Allium sativum ethanolic extract in thioacetamide induced hepato-toxicity in albino Wistar rats. 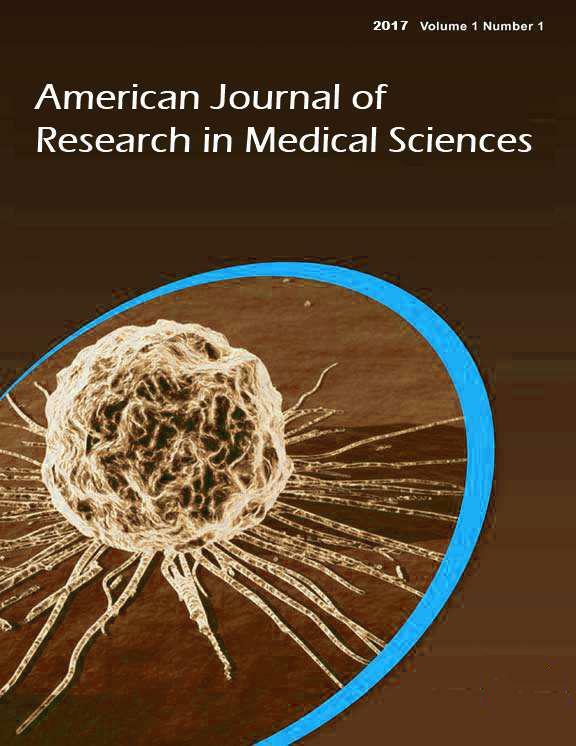 The articles in American Journal of Research in Medical Sciences are open access articles licensed under the terms of the Creative Commons Attribution Non-Commercial License (http://creativecommons.org/licenses/by-nc-sa/3.0/) which permits unrestricted, non-commercial use, distribution and reproduction in any medium, provided the work is properly cited. Copyright © 2019 American Journal of Research in Medical Sciences All Rights Reserved. Subject to change without notice from or liability to American Journal of Research in Medical Sciences.